Roman Catholic bishops in the Philippines are to return sport utility vehicles (SUVs) received as gifts from government funds, an inquiry has heard. Senators are investigating claims that illegal gifts bought with state lottery money were given to the bishops by the last government to win their support. The bishops acknowledge accepting the cars but say they did so only to help poor people in remote communities. More than 80% of Filipinos are Catholic and the clergy are highly influential. At the Senate inquiry in Manila on Wednesday, bishops turned over four SUVs and said others were in the process of being returned. The bishops apologised for any pain caused to their followers or the Church, but insisted the donations were only to help them reach isolated communities. "Even if it is not unlawful and even if it is not unconstitutional, we believe that it is important for us to clear everything in the air and return the vehicles," Archbishop Orlando Quevedo of the southern Cotabato diocese told the inquiry. He expressed "sincere sadness" on behalf of the Church that many Catholics were "confused, disturbed and even scandalised". The head of the Philippine state lottery, Margie Juico, earlier told the hearing that seven bishops received gifts during former President Gloria Arroyo's term in office. Critics have accused Mrs Arroyo of using donations to try to secure the bishops' support. She stepped down last year after nine years in power. Mrs Juico said an audit had showed that at least 6.9m pesos ($158,600; £98,300) in charity funds were used to buy vehicles at the request of several bishops. Bishop Juan de Dios Pueblos, of southern Butuan city, admitted that he wrote to Mrs Arroyo to ask for a sport utility vehicle costing 1.7m pesos for his 66th birthday but said it was to help him reach remote areas on Mindanao Island. He acknowledged that the move "was a lapse in judgment on my part" that has "cast a shadow of uncertainty on my dignity as a bishop and my moral ascendancy as a leader of the Catholic Church." 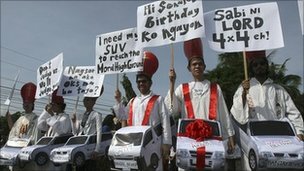 During the hearing, dozens of protesters held placards outside the Senate, some wearing bishops' frocks and cardboard replicas of SUVs around their waists. "I need my SUV to reach moral high ground," one placard read.